Step aside pumpkin spice, pecans are here to rule the dinner table this fall season. While pecans are notoriously used in countless mouth-watering desserts, we’re spicing things up by providing you with some of our favorite pecan-inspired dinners. From soul-warming soups to fancy fillets of fish and everything in between, these festive dishes will expand your taste pallet while teaching you all the unique ways pecans can be utilized! Plus, any guests you cook these dishes for won’t want to leave without the recipe in hand. Amp up your kitchen this fall season with the following fun and festive pecan dishes. In a shallow bowl, mix together all-purpose flour, ½ teaspoon of salt, ¼ teaspoon of black pepper, onion powder, and garlic powder. In a second shallow bowl, add the eggs and lightly beat with a fork. 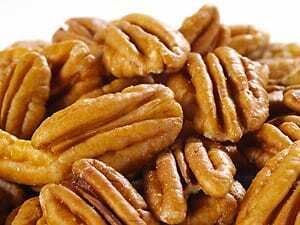 Place pecans to the food processor and pulse until they are completely ground. Add the fine ground pecans into a third bowl with the parmesan cheese, ½ teaspoon of salt and ¼ teaspoon black pepper. Heat oil in a large, cast-iron pan over medium heat. As the pan is heating, lightly coat both sides of the fillets with the flour mixture, dip in the egg mixture, and then the pecan mixture. Place the fish fillets in the pan and cook on each side for 4 minutes or until golden brown. Remove fillets from the pan and set them on a wire cooling rack. Sprinkle with salt. To make the Dijon cream sauce: turn down the heat to medium-low. With a paper towel, wipe out any excess pecan crumbles and add butter to the pan. Once melted, add garlic, shallots, and a pinch of salt. Stir until the shallots are translucent–about 2 minutes. Add the white wine to the pan and let it simmer until it reduces by half. Stir in the chicken stock, whole grain mustard, Dijon mustard, and capers. Simmer for 2 minutes. Stir in the heavy cream and allow mixture to reduce and thicken. Season with salt and pepper. Drizzle the cream sauce over filets and serve. Garnish with parsley. Pair this delicious meal with your choice of veggie–we recommend zucchini and squash–and a healthy grain. Place pumpkin quarters on a baking sheet and drizzle with 2 tablespoons olive oil and sprinkle with salt and pepper. On a separate baking sheet, place sweet potato chunks and drizzle with 2 tablespoons of olive oil, salt, and pepper. Toss to coat evenly. Bake both trays for 35-40 minutes, or until the sweet potatoes and pumpkin are tender. Set aside. As the pumpkin cools, you can peel and discard the outer layer. Heat remaining 2 tablespoons of olive oil in a large skillet over medium heat. Add leeks and grated carrots. Sprinkle with salt and pepper. Stir until tender and add garlic, rosemary, and thyme. Cook for two minutes. Add sweet potatoes, pumpkin, chicken stock, and parmesan cheese to a blender and puree until smooth. Transfer the soup to a pot and cook on medium-low until warm. For the pecan pomegranate salsa: add all the ingredients to a bowl and stir together. Sprinkle over the soup and serve. This delightful fall soup is sure to warm your soul and your body during the brisk fall season. Heat water in pot on stovetop for pasta. Sprinkle water with a touch of salt. Once bubbling, add in pasta, cook, then drain and set aside. To make spicy pecan Italian sausage: In a pan over medium heat, add oil, onion, fennel seed, black pepper, paprika, garlic powder, sea salt, and red pepper flakes. Cook until onions are translucent. Add pecans, red wine vinegar, and onion mixture to food processor and pulse until it resembles the consistency of ground meat. Brush zucchini and yellow squash with olive oil and place on grill for 3 to 4 minutes per side. Remove and chop into small cubes. Mix the pasta, pecan sausage, and veggies together and serve. What’s truly unique about this dish is its versatility. If you and the family aren’t feeling pasta, simply switch it out with a flatbread and through it in the oven. You’ll have a delicious Spicy Pecan Italian Sausage and Grilled Veggie Flatbread. All of these meals are healthy, tasty, and are perfect for the fall season. Serve up these pecan-inspired dishes and transform your kitchen this fall.